Ships today if you order in the next 13 hours 9 minutes. Black Elderberry has been traditionally used for its resistance-enhancing properties. 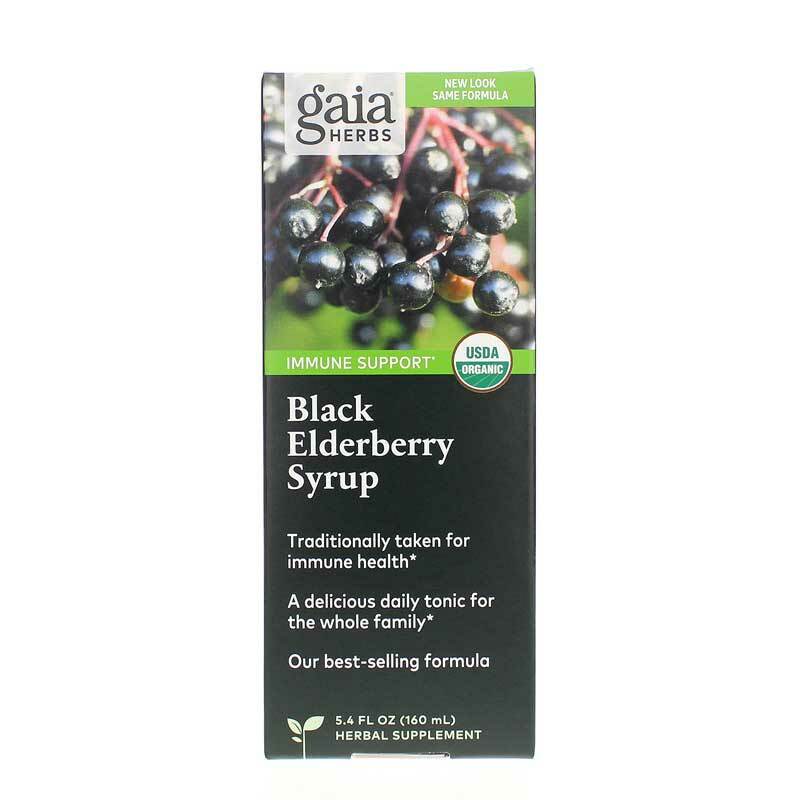 It now comes in delicious, natural, and highly-concentrated syrup from Gaia Herbs. European elderberry (Sambucus nigra), has been recognized in Europe for its health-promoting properties for many generations. It is known to contain a range of anthocyanins, flavonoids, and other polyphenolics that contribute to the high antioxidant capacity of its berries. Elderberry has an extensive history of being used in the early stages of seasonal immune challenges. Elderberry has long been proposed as being immune supportive, and supports the body's natural defense. The immune maintenance properties of Elderberry were first studied by a virologist who was able to demonstrate that elderberry constituents could neutralize activity of hemagluttinin spikes found on the surface of many viruses. When these spikes became deactivated, the virus was no longer able to pierce and enter the cells walls, which reduced virus cell replication. 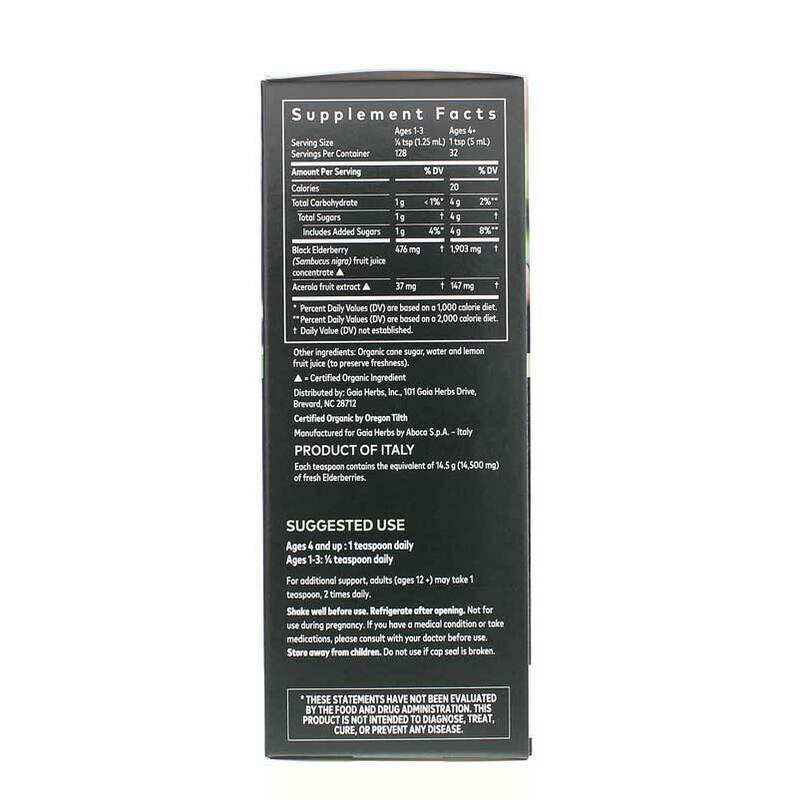 Research studies show Black Elderberry to have immune modulating and antioxidant properties. Chemical constituents that contribute to these effects include flavonoids such as quercitin and rutin, and anthocyanins identified as cyanidin-3-sambubioside and cyanidin-3-glucoside. Other plant components include hemagglutinin protein Sambucus nigra agglutinin III (SNA-III), cyanogenic glycosides including sambunigrin, viburnic acid, and Vitamins A and C.
While scientific research demonstrates that Elderberry supports the bodys natural defense against viruses, evidence is not conclusive and warrants further research. Other Ingredients: organic sugarcane, water, lemon fruit juice. This product is not to be used during pregnancy or lactation. This product is suitable for children. If your child is younger than age two, please consult a healthcare practitioner before administering. If you have a medical condition or are taking pharmaceutical drugs, please consult with your healthcare practitioner first. Black Elderberries have not been studied to evaluate their interactions with other medications. Keep out of the reach of children. Support for the entire family! Black Elderberry Syrup was recommended to me by my naturopath. We all love the taste! You can take it right off of the spoon or easily mix it with water or juice. Its difficult to find something that will work for all of us- but Gaia's syrup does the trick! Very safe and effective- I will continue to buy again and again! Gives immune system a tremendous boost. Taken at first sign of a cold or allergies and, for me, it prevents both from setting it. Taken daily, it keeps me healthier. Tastes delicious. Very expensive - yet well worth it. Love this stuff, anytime immune system down it gives me energy and strength and feel it helps me heal faster.